Zerust®/Excor® offers a full line of corrosion inhibitor packaging and rust solutions. 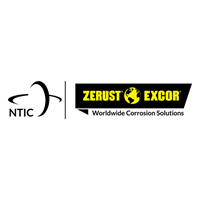 Zerust is the inventor of Volatile Corrosion Inhibitor (VCI) infused plastics technology and offers expert onsite support in over 60 countries worldwide. For over 35 years, Zerust has helped customers reduce the cost and problems associated with corrosion. Have a challenging corrosion prevention need, such as overseas shipping or storage in corrosive environments? Trust Zerust to help you manage corrosion in your operations. Zerust is a business unit of Northern Technologies International Corp. For more information, visit www.zerust.com. Zerust offers a total solution for protecting your metal assets from corrosion during every step of the manufacturing process. Our technical service providers can help select corrosion inhibitor prevention tools ideal for your processes, from raw material to delivery to the customer. Learn more about VCI packaging, rust preventative liquids, rust removers, complimentary onsite support and more. Solutions for outdoor storage, long-term storage, contaminated environments and more. Typical industries serviced are automobile, agriculture, heavy machinery, Oil and Gas, electronics, and anywhere bare metals need protection from corrosion.